Finding meaningful nutrition that tastes good, is stomach-friendly and doesn’t combust in your bike jersey pocket is hard work. Thankfully, three rock-solid (but eminently chewable) options came out during our time in Las Vegas at the industry’s biggest gathering. 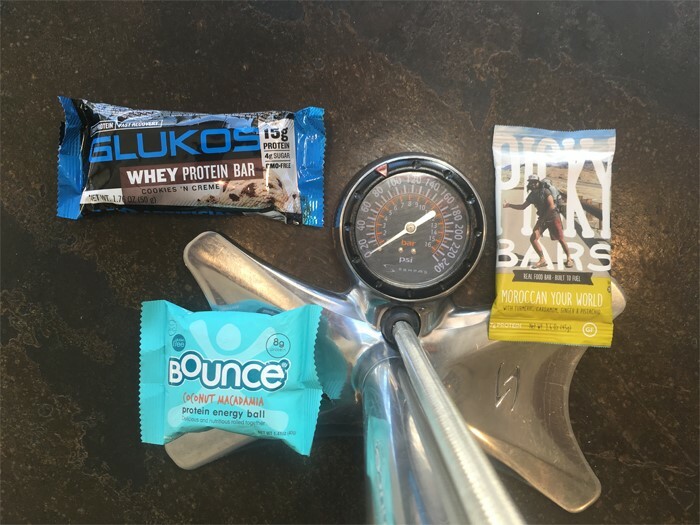 GLUKOS Cookies ’N Creme stomps it at 15g of whey-based protein with only 4g of sugar in a GMO-free 50g bar. At 190 calories, it’s a worthwhile recovery bar that Active Junky likes for the road as well (the calcium inside is a beautiful bonus). PICKY BARS “Moroccan Your World” spices it up with turmeric, cardamom, ginger and pistachio for chewy inspiration flowing from pro runners and triathletes. Protein hits the 7g mark in the anytime 45g, gluten-free favorite of avid cyclists looking to add variety (their other flavors are delicious as well). Not to be ignored, BOUNCE rolls in with 8g of protein in the Coconut Macadamia energy ball at 40g total weight. Gluten-free as well, BOUNCE is cold processed and logs 160 calories with plenty of whey components to deliver the goods (with stunning taste to reward hard rides). Any of the three are super choices. Together, there may be no stopping you on the next road or trail ride.